But after decades working in publishing herself, Harriet decided she could no longer deny herself the time to write her own books. 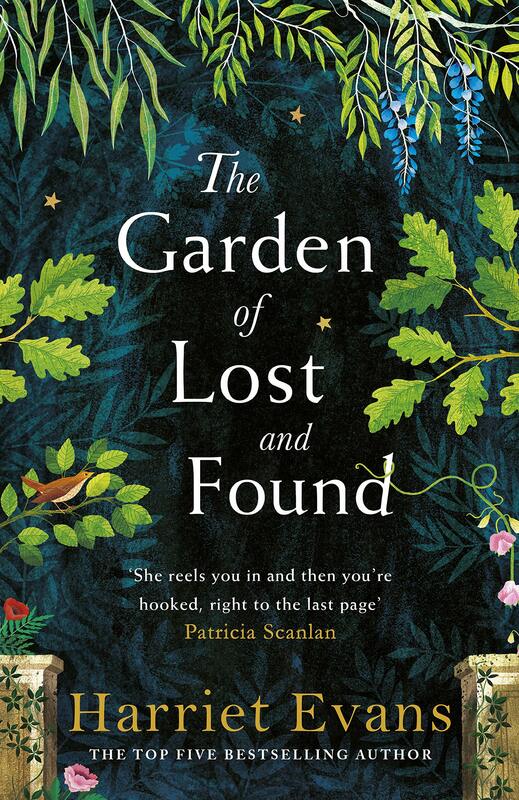 Fast forward a few years, and she’s just finished her newest novel, The Garden of Lost and Found, which goes on sale on the 18th April 2019. I was an editor at Penguin and started writing a book in the mornings before work. I’d get up at 6am and write for an hour and a half. Now I think I must have been mad, but I had to do it. I’d been wanting to write all my life, and it was just a thing of knowing I couldn’t put it off any more. I was sick of reading awful books on submission that went on to sell for loads of money. I still write the books I want to read, that’s the thing. However, I lost the first novel I was writing when my hard drive failed. I woke up one morning and turned the very old laptop on and the whole thing had gone. Yes. 30,000 words. So I had to buy a new computer (thank you Dixons in 2002 for your ‘Buy now pay a year later’ scheme) and I had a year to make some money back. I started over again – and it was much better as a result – then submitted it anonymously to an agent, worked with him for a bit and then he sent it out to publishers, several offered, and I was lucky enough to get a deal. I was lucky throughout as I worked in publishing and knew I was ‘allowed’ to do it. Lots of people think they can’t, that they’re not clever enough, they’re not right. They’re wrong. How do you develop your characters and make them feel authentic? A book is nothing if the characters aren’t utterly believable. I spend a lot of time thinking about them and, if the book isn’t working, I stop and spend a day getting to know a character who is troubling me. I’ll build up a past history for them, write something in their voice, find photos of someone who looks like them… it all really helps. None of it goes in the book, but it ends up making the story credible. It’s from my last book, The Wildflowers, and it’s from near the beginning, after the daughter of the family has had a phone call from her estranged brother telling her their mother is dying and wants to see her again. Cord says no and then we start to wonder what could have led her to abandoning her family. She knew she would not sleep, not now she had looked back, down into the darkness again. Yet through that airless night as she lay with the duvet thrown off the bed, hot and restless, arms spread wide, eyes fixed unseeingly at the ceiling, Cord could only remember the good times. They had been the Wildflowers, and they had been so blissfully, gloriously happy – hadn’t they? Before she – and it was her, the fault was all hers – had deliberately dismantled it all. Bit by bit. A family’s happiness. Her family. I Capture the Castle, by Dodie Smith – I read it when I was 22 and couldn’t believe such a glorious story existed and I’d never read it before. It is still my favourite book. It’s so comforting, but also really dark and odd. He’s Just Not That Into You – that book really did change me from someone who wanted to persuade people into liking me into someone who had the self-worth to believe I shouldn’t go out with men who were foolish enough not to want to go out with me! I owe it a lot. What are the best and worst pieces of advice you’ve ever been given? I love that. It reminds me that writers panic too easily. You have to go wrong to go right. Enjoy the chaos of it being out of focus for a while, instead of panicking that it’s wrong. The worst piece of advice… I did once have three sets of editorial notes from my editor, my agent, and a junior editor. They all pointed out different things that were wrong with the book and suggested different ways to fix it. It nearly finished me off. What feminist issues do you think are most pressing today? Other than, you know, the whole sexual assault and harassment and killing of women on a daily basis? Mainly that women are asked these questions instead of asking men for once! The women I know are tying themselves in knots about work/life balance, gender pay gaps, raising their girls in the ‘right way’ and I never once see men being asked: what can you do? That, and the way the cultural gatekeepers are men. I grew up being told both insidiously and overtly that women weren’t funny, that books and music by men were worth more than women, and that decisions made by men were more likely to be right just because their voices were lower, basically. That is changing slowly, but in the meantime it is a vast relief to display my copies of Georgette Heyer and my Golden Girls DVDs with pride. Harriet Evans will be in conversation with w&h books editor and author Isabelle Broom later this month. The event takes place on Wednesday the 24th of April in London.